That's very nice, I love the way you have set it in your lawn. Good luck from me to and dont forget to show us the results. Thank you Nana d and Drc. The photo doesn't show how much the lawn slopes which is why we had to dig out to get a level base; hence the way it sits in the lawn. 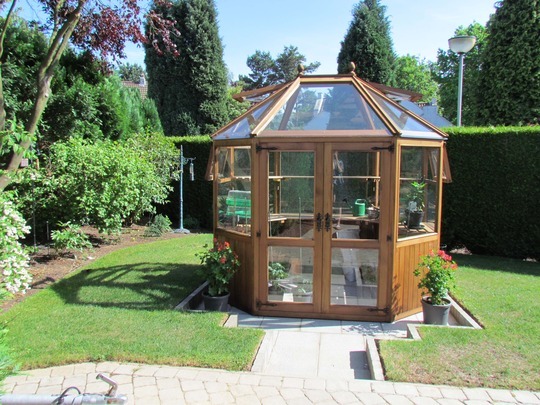 Believe it or not, I had to get the greenhouse from the UK as I could not find anything similar here in Belgium (well I could but it would have cost me almost 7,000 euros!!) This one came from Stafford, delivered to Belgium and erected by the company for less than half that price - and that included all the staging and shelving! I wanted a 'posh' one as it is highly visible from the road. I must admit that it is even better than I imagined it would be - complete with auto-vents! What a lovely greenhouse and it looks so nice where you have put it. Thanks everyone. I'm naturally delighted with it and just hope I can find some green in my fingers to make the plants grow and produce their goodies! I'll be sure to let you all know how I get on.